Can Self-Realization and Physical Immortality co-exist? Many schools of yoga emphasize that through various practices of pranayama and kriyas, one can not only gain super natural and super conscious experiences but also make the body healthy and disease free. Some schools of yoga go one step further and say that the human body itself can be made to live so long that it is practically immortal. There certainly have always been enough people willing to believe such things and pay for learning those secret methods that many schools of yoga prosper materially and their gurus live a nice comfortable life. Although there is no doubt that the practice of certain yogic exercises, walking, and a moderate, nutritious, and suitable diet leads to good health, that is not something that has ever been hidden from anyone. Many of yoga texts point this out explicitly. Sri Krishna, in fact, says in the Bhagavad-Gita that a yogi should eat nutritious food in moderate quantities and not sleep too much or too little. However, there is no mention of physical immortality. There is a good reason for that. The desire for physical immortality and Self-Realization cannot co-exist together. I certainly respect various yogic traditions of India. However, the emphasis on physical immortality among some yoga schools and practitioners seems like a diversion from the main path, a side show. There is a school in southern India where this tradition of perfecting the body so that it becomes immortal continues. We have all heard of Himalayan yogis who are long lived and some are reputed to be hundreds of years old. Whether these stories are true or not, I don’t know. Such accounts and stories existed also in Bhagavan Sri Ramana’s time. True or not, the Sage of Arunachala was always unimpressed by such things. 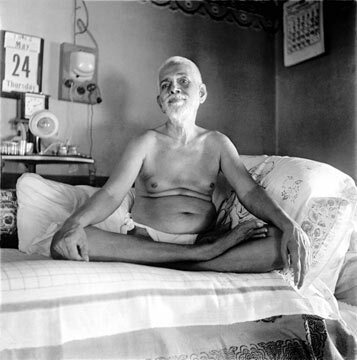 Sri Ramana sometimes used to joke and say that various people give enthusiastic lectures on physical immortality, prescribe various herbs and medicine and exercises for it, write long treatises on how to achieve it, and then at some point get old and die like everyone else! In the path of Sri Ramana, how healthy the body can be made or how long lived it can be is entirely irrelevant to Self-Realization. The idea of body only occurs in our perception which arises from consciousness. Therefore, we should pay attention to the nature of “perception” which arises in us. Without the clear knowledge of the source of all perception, one is lost in diversity of thought and moods. In doing so, we remain at the periphery of consciousness and in maze of contradictions impressed by every novel or interesting concept that emerges in this scenic view we call life. It is the inquiry, “Who Am I?” that serves to draw us in and center us in the source from where perception emerges. The one who gazes intently at the root of all perception, and roots out the illusion that gives rise to differentiation, will have no more questions left and no answers to give. When we experience our wholeness, the deep contentment that overtakes us makes us indifferent to attaining anything. All thing are transient, including this body and mind. Those who wish to attain physical immortality are only holding on to things which are bound to change and cannot be made permanent. One harboring such desires cannot give up everything and surrender one’s life and mind to the Lord of the Heart. However, it is only by offering our very identity, our individuality, that we evoke Grace, and realize our nature as the Heart, the Self. That is Self-Realization. It transcends identity with the body and mind completely. Therefore, the idea of physical immortality becomes moot in Self-Realization. He died, Oh, he died – .. of a body we lament…… Yet he stands calmly at the window in a new and strange garb!!! ”There is a school in southern India where this tradition of perfecting the body so that it becomes immortal continues”. Which school are you referring to? ”Therefore, we should pay attention to the nature of “perception” which arises in us. Without the clear knowledge of the source of all perception, one is lost in diversity of thought and moods. In doing so, we remain at the periphery of consciousness and in maze of contradictions impressed by every novel or interesting concept that emerges in this scenic view we call life.” Yes. ‘Ida sariram khalu dharma sadhanam’ The body is a means of sadhana and realisation, as we are embodiments [however ‘illusionary’] in daily living, not to be despised nor adulated. ‘There is a school in southern India where this tradition of perfecting the body so that it becomes immortal continues”. Which school are you referring to? My dear friend, how mistaken you are! Try to understand the real Spirituality before you post such articles.By the way, my email is is nor correct but my feedback is.